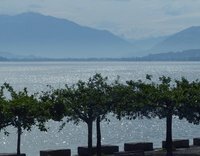 View VT Euromeet 2017 on ToonSarah's travel map. Today was all about 'collecting countries' as we managed to visit three in one day. Indeed, by midday we were already in our third! 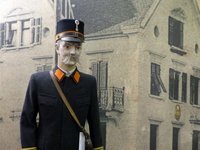 We took a train (expensive, as is everything in Switzerland it seems) from Zurich to Sargans and from there a bus which took us through Vaduz in Liechtenstein (to where we would return later) and on to Feldkirch in Austria. 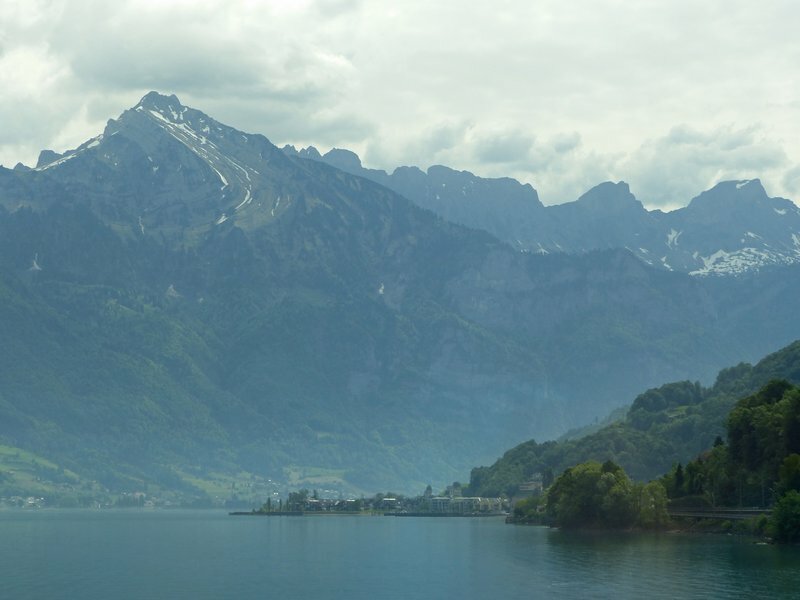 The scenery on both journeys was fantastic, especially the views of Lake Zurich and the Walensee from the train. The latter was a particularly beautiful shade of deep turquoise as it is fed by several glacial rivers and streams. From the bus too we had some lovely views, passing through several tranquil villages in rich farmland, with hills and mountains all around and the occasional castle perched on a ridge. 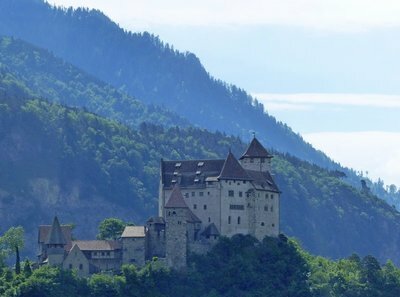 The most impressive of these was Burg Gutenberg which we passed just after crossing the Rhine which here forms the border between Switzerland and Liechtenstein. On arrival in Feldkirch we had a light lunch in a café - I enjoyed a salad and a small beer, and it was quite a pleasant change to pay Austrian, rather than Swiss, prices for these! 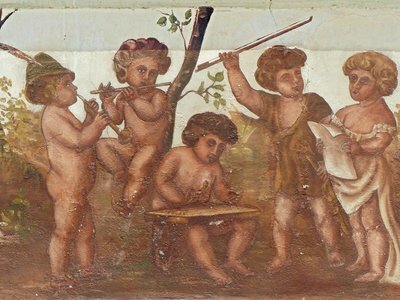 The café was one of several in the Marktplatz where a market was indeed taking place. This had unfortunately more or less packed up by the time I finished eating and went to take photos of the activity but there was plenty more to photograph including a lovely old church by the market (Sankt Johann), with its fresco depicting St John the Baptist preaching a sermon, and the unusual figure of a knight known as the Bläsi who has rung the bell to tell the townspeople the time since 1510. 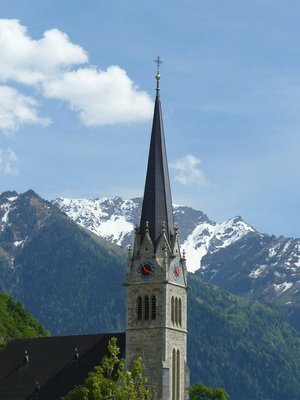 The church was unfortunately closed, so I only have photos of the exterior. The town retains much of its medieval character here in its centre but just behind the church we came across a very different style of building which divided opinion – some finding it too incongruous for this historic setting and others (me included) rather liking its striking architecture and clean lines. 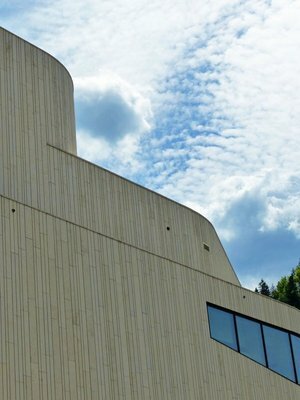 This is the Montforthaus, a culture and congress centre which was opened in 2015. 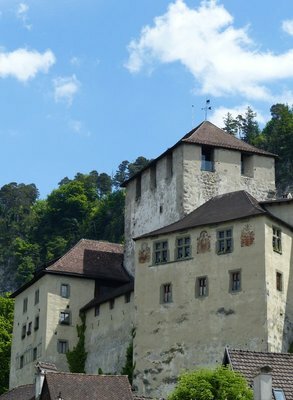 In contrast the castle, Schattenburg, has been perched on a hill above the town for almost 800 years. 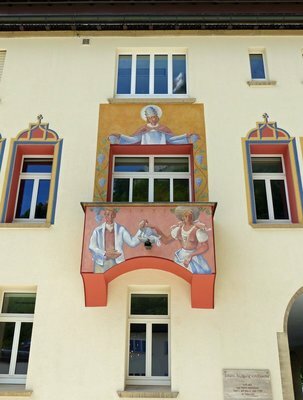 We strolled along the picturesque streets, where there were plenty of the small details I always love to photograph, including some attractive murals on some of the buildings. 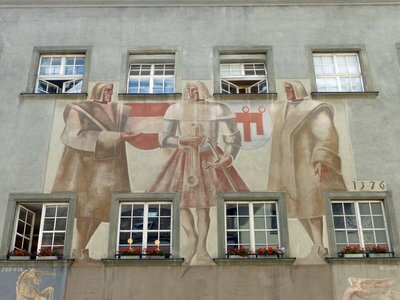 The large figures on the town hall (Rathaus) depict scenes from the town’s history. 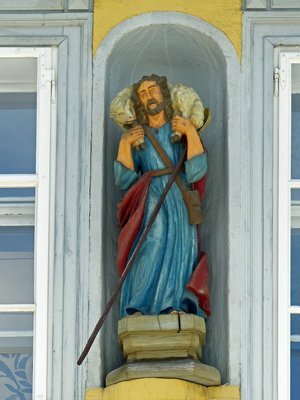 There were also a number of religious statues on otherwise secular buildings – I noticed several of the Good Shepherd in particular which perhaps reflects the town’s rural, agricultural surroundings. 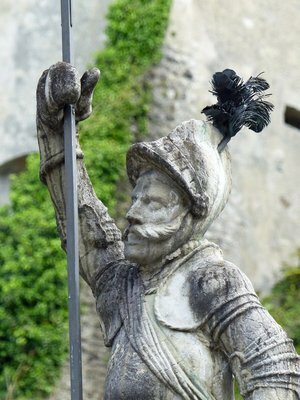 The statue of the rather fierce knight, in contrast, is on a fountain just below the castle. 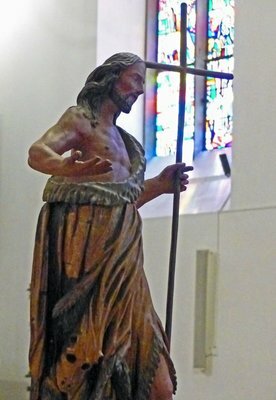 We went into the cathedral, Dom St. Nikolaus, which was light and airy, looking more modern than its Gothic origins would suggest – perhaps due in part to its beautiful modern stained glass, the work of local artist Martin Häusle. 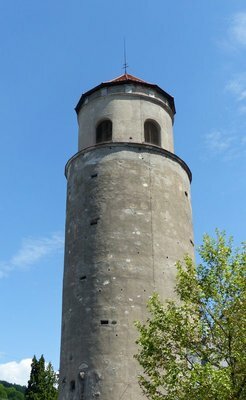 From here we returned to the bus stop by the intriguingly named Katzenturm or Cats’ Tower, so-caled because the cannons it used to house were nicknamed cats! 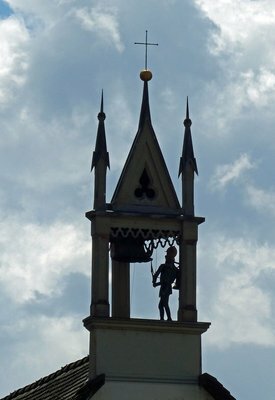 It was built on the site of an earlier tower by Emperor Maximilian and today contains a large bell which is rung every Friday at 3.00 pm (the hour of Christ‘s death) and on church holidays. 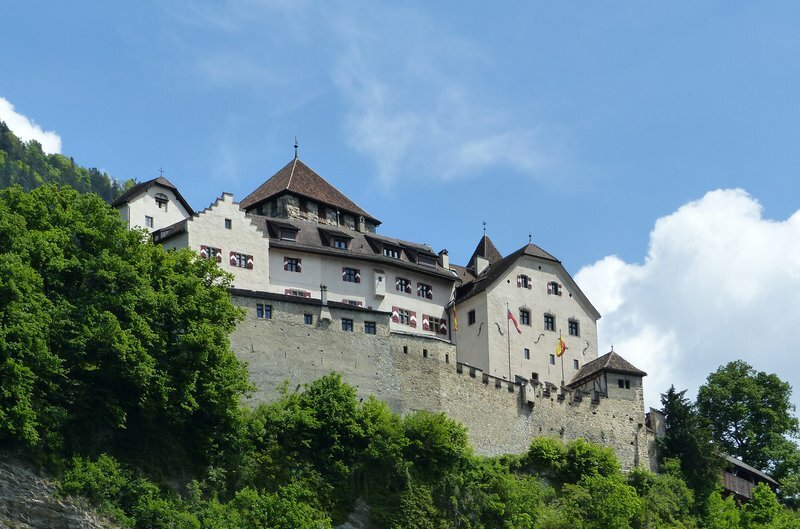 From Feldkirch we caught the bus back to Vaduz in Liechtenstein where we were greeted with the impressive sight of the castle where the Princely Family still lives. We had drinks in a café on the main street before splitting up to explore. 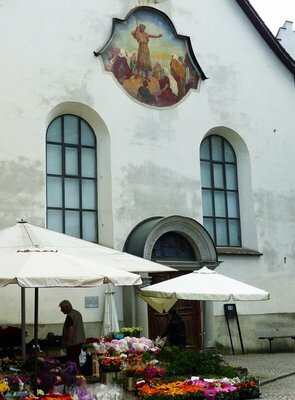 This is an attractive, almost unnervingly well-maintained town centre with some attractive modern sculptures and several sights of interest including what looked like an interesting art gallery which there was no time in our schedule to visit. 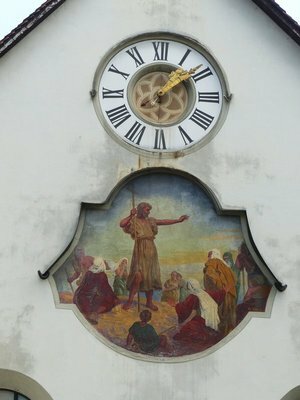 The town hall has some striking murals and a plaque marking the very brief visit of Goethe to the town “from 1 to 2 June 1788 on his way back from Italy”. Steve and I found a place offering to put a (meaningless but fun) stamp in our passport for 3 francs (or euros) - something tangible to show for our extravagant but lovely day out. We also made a brief visit to the postal museum (really probably only of interest to avid stamp collectors – we didn’t linger). 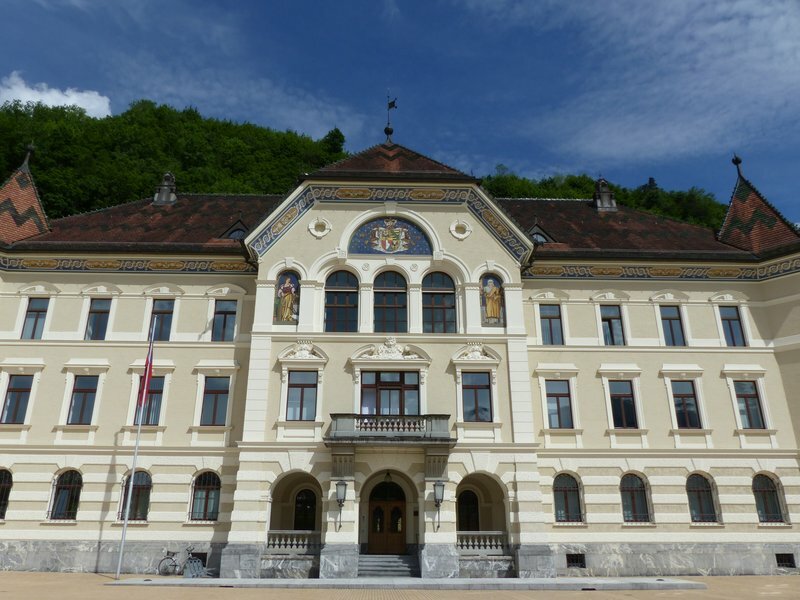 Of more interest was the beautiful government building which dates from 1905 and is the official seat of the government of the Principality of Liechtenstein. 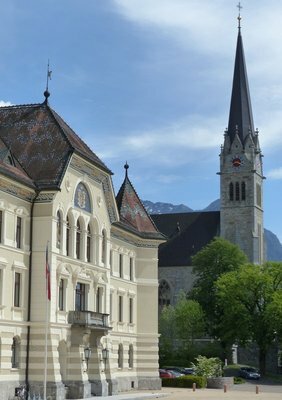 Nearby is the parish church of St. Florin, built in 1873, but with buses back to Sargans running only once an hour we decided not to linger any longer as we wanted a more restful last evening back in Zurich. 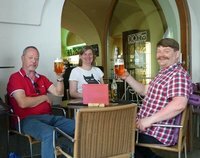 So Steve, Yvonne and I together retraced our steps via bus and train back to Switzerland and to Zurich. 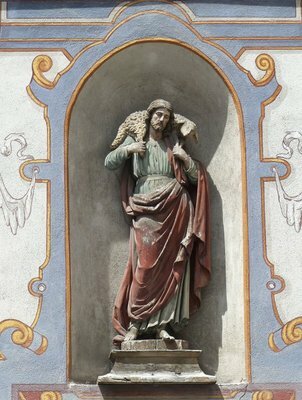 There we stopped off at the ticket office in the station to buy our train tickets for the journey to Kempten tomorrow. 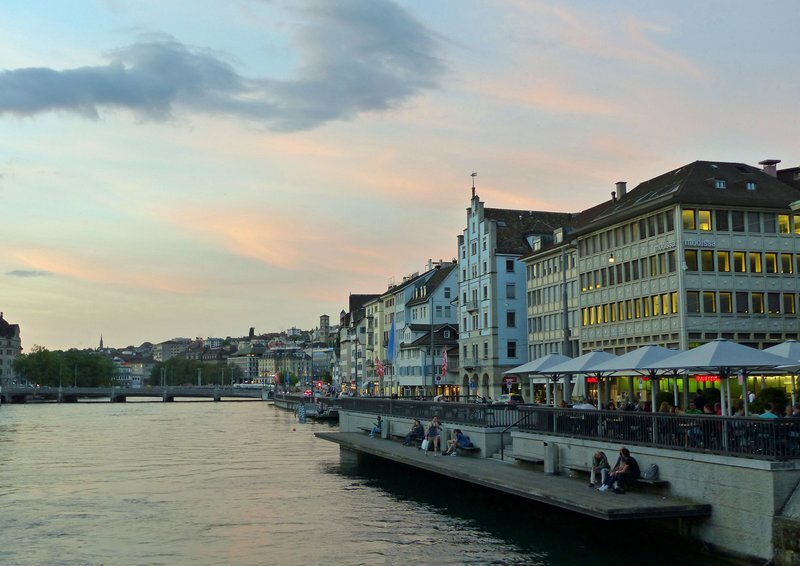 In the evening we decided not to get a full meal but instead went to the Rathaus Café by the river's edge to drink and enjoy the views – though we did get tempted by the excellent olives and reasonable pizzas once there! We had a super relaxing evening together - a lovely way to end our time in Zurich. I think I will start a private album of "My drinks around Europe" as everyone seems to have taken photographs of my holding as glass (Keep them coming folks!). 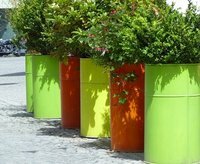 Thankyou so much for your wonderful posts Sarah - it brings each day back into focus and very much alive again. 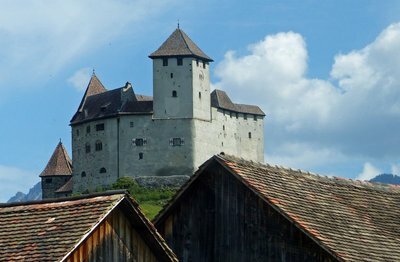 I've always wanted to visit Liechtenstein (since I used to know someone who grew up in Vaduz), but somehow never made it. Looks great in your photos! I had never known anything about the country before we visited that day - apart from the fact it was so tiny - but I was impressed by all I saw there and, if ever you get the opportunity, I would certainly recommend a visit. The scenery is spectacular; the architecture fascinating - both the traditional and the ultra modern; also many statues both traditional and modern. The prices are certainly easier on the purse than in Zurich! The flowers in the "one still-open market stall" perfectly complement the painting above them. Beautiful. True that trains et al are expensive in Switzerland -- I think their prices preserve a certain character. 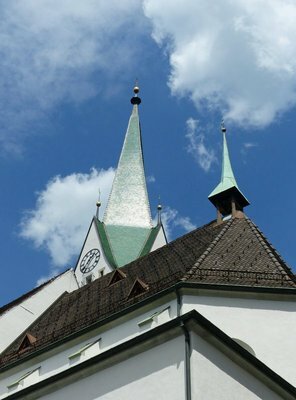 :-) I was in Feldkirch twice and loved it. 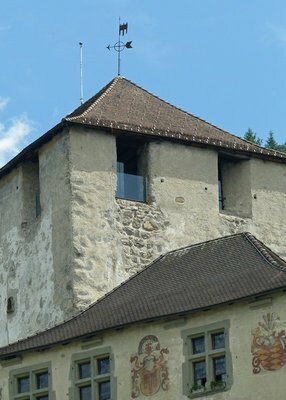 Later, my grandson stayed there with his Dad, who played hockey with the Feldkirch team. 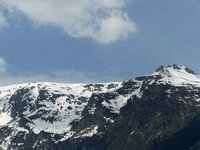 Switzerland is unique in every way! Thank you Lou. 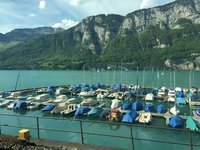 Zurich was SO worth the extra cost, I loved the city and my time there with VT friends :-) If ever you do make it there you should look up Sonja - she's an excellent guide and likes introducing VT friends to her home city! More inspiration, especially Rathaus Cafe and ... the train station with this lovely Niki de Saint Phalle sculpture :-) Excellent photos! 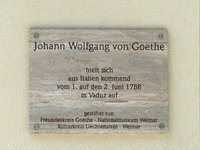 Haha, and I laughed when I saw the sign that Goethe was there. Is there any place in the world (or Europe) where he wasn't? 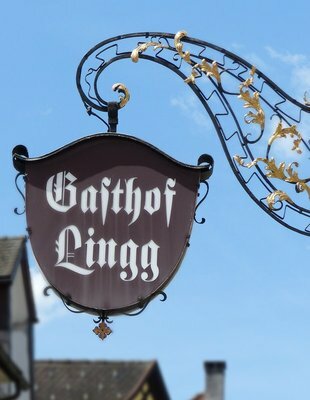 Thanks Ingrid Yes, the Rathaus Cafe was an excellent spot! And I think Goethe in Europe must be like Elizabeth I in England - if you added up the number of nights she is supposed to have slept in various inns and stately homes i would probably come to more nights than she lived to see! Lol Don - I bet every country has its version of this! I read it Sarah! 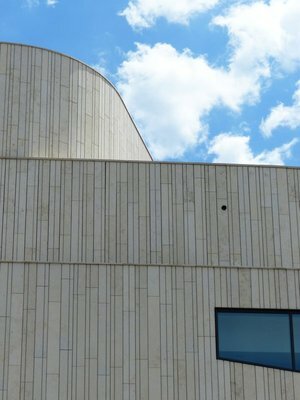 Excellent blog and photo's as always! 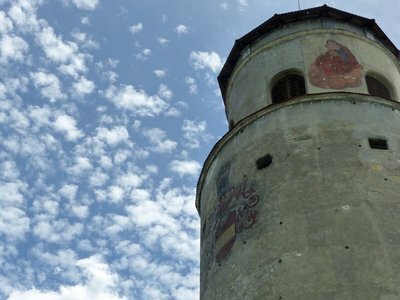 You make Liechenstein worth a visit. Thanks Katie. 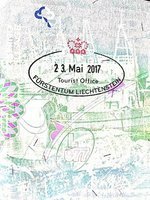 Hope you enjoy Liechtenstein too - and don’t forget to have your passport stamped there!